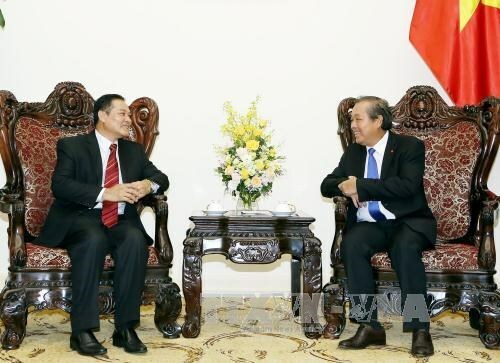 Hanoi (VNA) – Deputy Prime Minister Truong Hoa Binh has affirmed that the Vietnamese Government supports its Committee for Religious Affairs and the Lao Front for National Construction (LFNC) to enhance cooperation in religious affairs. Binh made the statement at his reception in Hanoi on August 23 for LFNC Vice Chairman Chanthavong Sene Amatmontry. He said he is delighted at the development of bilateral relations in all fields, with religion receiving special attention from both Governments. The two agencies should maintain training activities in religious work, step up the exchange of high-level delegations, organise conferences to share experience in religious work between provinces along the border, and facilitate collaboration between the Buddhist Sanghas of Vietnam and Laos. The Deputy PM also requested the LFNC to create favourable conditions for the Vietnamese community in Laos to assimilate to the religious practices in the country. Chanthavong Sene Amatmontry informed the host of the outcomes of talks between the Lao Front for National Construction and the Vietnamese Government Committee for Religious Affairs. At the talks, the two sides agreed to maintain delegation exchanges, intensify the training of officials in charge of religious affairs, act as bridges boosting cooperation between the two Buddhist Sanghas, and build a cooperation plan for 2018-2020, he added.